Jay Jays designer wear is a brand out of Australia that has successfully infiltrated in to the South African market. These stores offer some of the quirkiest and stylish clothes and cater to the youth market that means that they are fully aware of the minimal budget that many youths are working off of. This means that you can get fantastic clothing at fantastic prices and be the envy of all of your friends for being the most stylish of the lot. 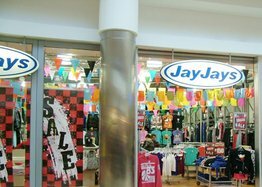 Any parents reading this, this store is for you too as if you are still buying clothes for you children, then why not take them to Jay Jays as you will not break the bank and will make everyone happy. Jay Jays designer wear is a fast fashion offering that offers an extensive product range from street wear, to surf styles, and casual basics. This store also offers a great deal to its customers in the way of discounts. One great thing about this store is that with every purchase over R 100 you get a sticker. Then when you collect four stickers, you get a huge 20% off of the next purchase when you show them your completed card with the stickers. It really is that simple to save at Jay Jays. So all you fashion forwards youth who are looking for an incredible outfit that will make all your friends jealous and make your bank account happy, why not take a look in one of the many stores across the country. From Sandton City in Johannesburg, to Cavendish Square in Cape Town you can find all you need for any season and occasion in these funky stores. There really is nothing stopping you and your friends from visiting one of the outstanding stores of Jay Jay’s designer wear.